Download math video tutorials for teaching addition for levels Kindergarten to 6th Grade. Download math video tutorials for teaching subtraction for levels Kindergarten to 6th Grade. 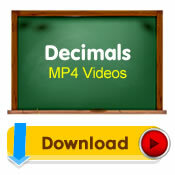 Download math video tutorials for teaching decimals for levels 3rd to 7th Grade..
Download math video tutorials for teaching algebra for levels 3rd to 7th Grade..
Download math video tutorials for teaching multiplication for levels 2nd to 7th Grade. This membership plan is for online use of our site. You will get access to all materials in the members area. If you'd also like to download videos, visit our store here.